From risk management principles to complex policy and coverage analysis, CPCU is the premier designation to ensure your professional success. Complete the program in 2-3 years. Enhance your career like over 69,000 CPCUs before you. 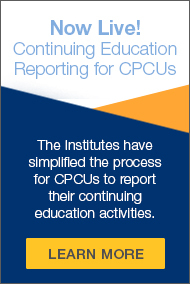 of CPCUs believe earning their CPCU prepared them for their long-term career goals. Put your career on the fast track. of CPCUs say earning the CPCU designation accelerated their careers. Gain access to a network dedicated to helping you succeed. of CPCU Society members value the opportunities that being a member gives them to engage with industry experts. You can take courses in any sequence according to your background, needs, and interests. In order to satisfy the CPCU education requirements you must pass in any order; four foundation courses, all three courses from within your choice of either the personal lines concentration or the commercial lines concentration, and one elective course. To satisfy the CPCU ethics requirements, you must either pass the 50-question exam in the free online Ethics 312 module OR have completed the CPCU 510-Foundations of Risk Management, Insurance, and Professionalism course. The CPCU Code of Professional Conduct notes ongoing professional education as a core value for every CPCU. Learn more. Matriculate with The Institutes by completing an online form and submitting a fee-- this registers you as a CPCU designation candidate and requires you to abide by the CPCU Code of Professional Conduct. It is recommended that you matriculate as early as possible in your CPCU studies. You will receive a link to the matriculation form when you register for your first exam. Before earning the CPCU Designation, you must be able to show that you were engaged for a minimum of 17 1/2 hours a week in acceptable insurance activities for any 24 months during the five-year period immediately preceding the conferment of the designation.